Honors Archives - Art Matters! Yesterday I was (giddily!) 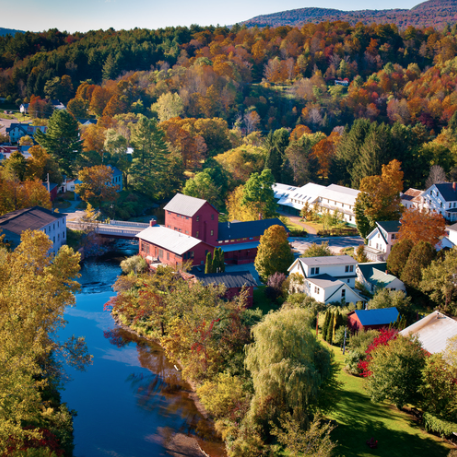 accepted for a month-long residency in writing at Vermont Studio Center for this September/October. I’ve wanted to go for two decades, and I’m so grateful for this opportunity! And I’ve been using waaaay too many exclamation marks for the last 24 hours! VSC is the largest, international artist residency in the US, and in addition to writing time with full room and board, residents get to connect with fellow artists and visiting faculty across genres. It’s a poet’s dream! Not only that, I’ve always hoped to visit New England in the autumn to see the leaves, so this is like a “two-fer” dream come true! That’s the good news. The mixed news is that though I received a grant that covers a small part of the fee to attend, I need to pay the $3000+ balance in exactly two weeks: on August 16. I paid my deposit on faith. I thought; if the dream arrives at your doorstep, you figure out a way to carry it inside! And that’s where I need some help. Usually, I’d have time to apply for a professional development grant (I put myself through undergraduate and graduate studies on grants, scholarships, and fellowships—I’m always willing to do the work! ), but since I was awarded a residency near the start of VSC’s academic year, I don’t have the time to go that route. So I’m getting creative and inviting you to help me do something I would normally work out by myself. In fact: maybe part of my lesson in this is learning to ask! I’ve got fiction, poetry, and “children’s books for grownups” on offer! And it’s a bonus if you buy them directly via the links on my webpage. Find books here. I named my greeting card line Take Heart because I love and live the art of encouragement. The image at the opening of this newsletter is from one of the cards, and you can see all 10 designs here: Take Heart Cards. The cards feature a micropoem and watercolor image, are printed in Oregon, hand-embossed with my ae logo, and blank inside for you to spread encouragement in the world. They are great for giving or keeping, mailing or framing. For more sets, email me for a shipping quote! To order, you can pay through the secure server at my website, here. *Be sure to type “cards” in the description field and indicate your desired quantity. If you’re in Southern Oregon, join me tomorrow, Friday, from 4-6 pm for my First Friday Art Walk reception at Tail of the Sun (567 Fair Oaks Avenue, Ashland, OR). In addition to the art on sale, I’ll be doing live watercolor painting—come get a favorite word or name on your own bookmark! You can donate directly here (same link as for Take Heart Cards). *Be sure to indicate “donation” in the description field. 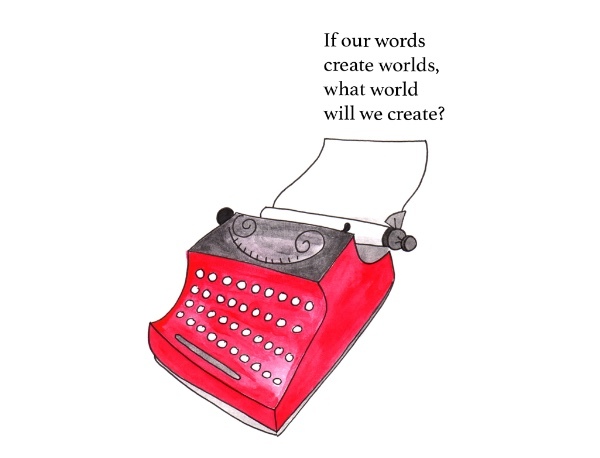 What world will we create with our words? I’m hoping for a good one. And I’m hoping to do some of that creation at Vermont Studio Center. I’m immensely grateful for any and all support! PS: Fun fact: I used frequent flyer miles and got an airline ticket from Oregon to Vermont for $11.20! I figured that’s a good sign that all things are possible…. During the month of May Nancy Graham’s work will again be featured in the Salon and Bee Bantug will be the featured artist on the feature wall at Art du Jour Gallery, 213 E. Main in Medford. Nancy Graham featured Salon artist at Art du Jour Gallery for the months of April and May. Nancy has always been passionate about art in all forms and styles, as evidenced by the variety of subjects she likes to paint, and the varied approach to each. She was always encouraged by her mother, who was a well-known artist in California and an art instructor at Dominican College in San Rafael a number of years ago. She teaches that there is more to a successful piece of art than the basic fundamentals of art theory, and she likes to experiment with a variety of styles and approaches as evidenced by the selection of pieces that will be showing at Art du Jour. Florals, landscapes, abstracts, still life’s and even a motorcycles engine are the subjects she’s chosen to show. She’s always excited to try something new and is challenged by the possibilities that watercolor brings to her artwork. However, if one were to ask her what she likes to do best, she would probably reply that she likes to paint “close-ups” where she can use her small brushes to bring out the finest details of her subjects. Nancy holds a secondary teaching credential and art degree from UC Davis, and is a member of Southern Oregon Society of Artists, the Rogue Gallery, a past President of Josephine County Artists Association and a juried member of the Watercolor Society of Oregon. As the featured artist for the month of May at Art Du Jour Gallery, Bee Bantug presents “As the bee flies’’. Not quite enigmatically titled, this body of work is part of a series celebrating the beauty and boundless bounty of Mother Earth. And, in seemingly synchronistic timing, through this work Bee pays homage to her beloved mother and all mothers. Technically and conceptually, her intention is to create evocative imagery using her camera as her brush and the objects and world around her as her palette. And then, pointedly never manipulating her images after the moment of creation. Aesthetically, she likes abstracting the real and manifesting ideas that intimate at the dynamics between expressionism and impressionism to deliver a distinctly different perspective. Recently, Bee Bantug was featured as a Selected Artist at Artrooms Fair 2018 London, one of only two US artists among 70 international others. Please come and enjoy creative imagery paying homage to all mothers! Art du Jour will begin accepting entries for our second “Peoples Choice” Photography Contest during the last week in April. Prospective participants should take special note that the contest will be part of our Art in Bloom exhibit, as visitors to the gallery vote for their favorite art work. Top vote getter will win $50 and a prize ribbon. The contest artists will also be honored at our Medford Third Friday Art Walk and Reception on May 18. There is a $20.00 entry fee. Call the gallery to register or come by to pick up an entry form. Space will be limited. Like our Facebook page for more info or contact us at (541) 944-1933. The results are in!! We’ve gathered all tallies for our “50 Shades of Fall” contest, and believe us when we say that competition was close, often with a single vote making the difference. All voting came from People’s Choice and Employee’s Picks, with the general public invited to cast their favorites during the entire month of October. So, without further ado, here are the official results with our First, Second and Third Place Winners along with several talented Honorable Mentions! “Evil Dead Cabin Revisited” by Danae Wilkin, “Fall Magic” by Kim Faucher, “Autumn Daydreams” by Judy LaNier, “Riding Into Fall” by Karen Menke, and “Autumn Clutch” by Selah Grace. Congratulations to all of these talented individuals, and a HUGE Thank You to all who participated in our contest! Every piece deserves a chance to shine, so we’re extending our window display through November 15th! If you want to take your piece home, you are welcome to pick it up anytime or show it off until the 15th. We hope you will continue to inspire us with your artistic visions in our future contests! Artistic Director Kyle Haden (center) and the ANPF 2016 readers. The winning plays were selected from 400 that were submitted. They were read and scored in blind readings by ANPF’s core of volunteer readers, who reduced the candidates to 12 finalists. From them, artistic director Kyle Haden chose the four winners. These exceptionally gifted playwrights will travel to Ashland for a week of receptions, rehearsals, a playwriting workshop, and other festivities that will culminate with dramatic readings of their plays. The plays will be performed in both matinee and evening performances at the Unitarian Center by some of our finest actors. Talk backs with Ashland’s famously sophisticated audiences will follow each performance. Read further for more information about the playwrights and their plays. In Hazardous Materials, she examines the course of several lives as investigators sort through the detritus left by an unidentified woman in a Chicago apartment. Kander’s works have been recognized by The Ruckus’ 2016 summer festival; BechdelFest 2016; Ashland New Plays Festival 2015; The Kilroys List (Honorable Mention 2015, 2016); Leapfest 2015; Downstage Left residency 2014-2015; Charles M. Getchell New Play Award 2012; and, three Eudora Welty New Play awards. She studied comedy writing at The Second City and is currently pursuing an MFA in Creative Writing at Mississippi University for Women. Michael Erickson, Oberon Springs, has had plays produced by theaters and colleges including the Ensemble Studio Theater, MadLab, Moving Arts, the Imaginary Theater Company, and Tesseract Theater. Oberon Springs looks at the impact of environment on the increasingly poor health of people in a small Indiana town, and a young physician’s struggle over whether to continue her life and her medical practice there. Erickson was playwright-in-residence at the Nashville Repertory Theatre and Coe College. His awards include an NEA Fellowship in Playwriting; a California Arts Council Award; and the Mobil International Playwriting Prize (Royal Exchange Theatre, England). His Alien Hand Syndrome was published in Regional Best 2011, an anthology of new plays. Last Tree, Easter Island, will be published this fall in the Smith and Kraus, Inc. anthology, 105 Five-Minute Plays for Study and Performance. A graduate of the MFA Theater Program at the University of California, San Diego, he teaches playwriting at Webster University in St. Louis. Mike Teele, EdanEv, lives in New York City. His work has been performed at theaters that include the Theatre for the New City; HERE Performing Arts Center; Abingdon Theatre; John Houseman Theater; Producers Club, Hudson Guild, and Catch a Rising Star. He has produced more than nine works for the stage and was a Walt Disney Studios /ABC-TV Fellowship finalist. EdanEv tells the story of four college friends, reunited in mid-life for a family wedding, and the life-altering decisions each makes about the next chapters of their lives. Teele also created and wrote The Real Friends, a live weekly sitcom that played NYC comedy clubs, and has written dozens of educational films for kindergarten through senior high. He was awarded the Cine’ Golden Bear International Film & Video Award for his work. Stephanie Walker, The Madres, is a Chicago native who now lives in Los Angeles. Her full-length plays have garnered awards, workshops and productions across the country including the 2015 critically-acclaimed premiere of The Art of Disappearing at Chicago’s 16th Street Theater. The Madres explores the experiences and activism of the Argentine women whose children disappeared during the military dictatorship between 1976 and 1983. The play has been chosen for a number of awards, including finalist for the 2016 O’Neill Playwrights Conference, for the Source Festival in DC, and for the Humanitas/CTG Playwriting Prize; and, winner of the BETC Generations Prize. Walker is also author of the book and blog, Love in the Time of Foreclosure, which has been called “a heartbreaking work of staggering acceptance” and featured by the Los Angeles Times, NPR, Business Week Magazine, and ABC World News Tonight with Diane Sawyer. “One Artist Changes His Art & Saves His Life” Interview, Video and Discount Codes! Artist Inger Jorgenson, uses Eco-Solve to create beautiful drip effects. Note from the Author: Natural Earth Paint sent Roberto a complimentary bottle of Eco-Solve to try after hearing of his health troubles. We look forward to hearing his feedback!! Roberto Parada is an internationally known oil painter and illustrator, having been published in Time, Newsweek, Rolling Stone, ESPN The Magazine, Entertainment Weekly, Esquire, and Huffington Post. Few people know that his art process came close to ending his life in 2004. I had the honor of interviewing him about his journey in discovering which of his art supplies were literally killing him, how it happened and what he did to change his process while continuing to paint very high quality, archival and professional paintings. Were you ever taught about the toxicity in art supplies in art school? I went to a very prestigious art school in the late 80’s and early 90’s and was never taught about any hazards in art supplies by my painting and illustration teachers. I did have one sculpture teacher who adamantly forbade the use of fixatives, solvents and chemicals because he had gotten lymphoma from the use of those chemicals. He never really explained why we shouldn’t use them but just told us not use them in his classroom. My painting teachers all used toxic materials themselves and probably just didn’t know the health risks involved. What was your painting technique throughout your school years and career? I have always been an oil painter and I’m guilty of never wearing gloves or having adequate ventilation or even thinking that I should. Noone ever taught me the risks and on the warning labels on paint thinners I only saw warnings about difficulty breathing and respiratory issues. There was nothing about the fact that it can get into your bloodstream and cause death risks. The warnings are very ambiguous and limited considering the fact that I can list 5 different types of cancer that come from paint thinners. For example, 3 kinds of leukemia AML, ALL, CLL, and Multiple Myeloma and Non-Hodgkin Lymphoma. I also used all of the heavy metal based paints – cadmiums and cobalts – and didn’t think much about it. In the 90’s the “Odorless Mineral Spirits” came onto the market and we all thought that this was a healthier alternative. Now I know that Odorless mineral spirits still have petroleum based distillates and benzene which is exactly what brought about my illness. How to use Eco-Solve to clean oil paint brushes without toxins or solvents! Does not emit harmful vapors. Superb for creating washes, under-paintings, glazes, drip effects, etc. The Green School in Bali uses Earth Paints exclusively in their curriculum and painted a collaborative Earth Day mural this year. Natural Earth Paint Wins the Cribsie Awards – 380,000 people voted that Natural Earth Paints have the “Best Non-toxic Art Supplies”! Every Thursday on Facebook we post a Coupon Code or FREE Give-Away! “Like” to get access. Caldera Executive Director Tricia Snell (right) and youth representative Alena Nore (center) visit the White House Nov. 17 to accept an award from First Lady Michelle Obama. Congratulations to Caldera, one of 12 national creative youth development organizations to receive the 2015 National Arts and Humanities Youth Program Award from First Lady Michelle Obama. Caldera Executive Director Tricia Snell and youth representative Alena Nore accepted the award at a Nov. 17 White House awards ceremony. Caldera is the first Oregon organization to ever receive the award, the nation’s highest honor for creative youth programs. It recognizes the country’s best programs while highlighting the positive role that arts and humanities play in youth academic achievement, graduation rates and college enrollment. It was with heavy hearts the arts community learned of the passing of former Arts Commission Chair Ron Paul. Ron was best-known as a chef and restaurateur, with the artistry and sustainability of food defining his professional identity. His work with the City of Portland engaged him at the intersection of politics and policy. As chief of staff to former Portland City Commissioner Charlie Hales, he helped shape plans to develop a year-round, food-focused Public Market. He also led the city’s lobbying for the creation of the Oregon Cultural Trust. Ron recently served as executive director of Portland’s forthcoming James Beard Public Market. Another feather in Oregon’s environmental cap — It is the only state to have its President’s Park (White House) tree decorated with recycled garbage!Incredibly beautiful marine garbage, transformed into art by Angela Haseltine Pozzi, the founder of The Washed Ashore Project in Bandon. Trees representing all 56 states and territories are annually displayed at the White House park and each year different artists are invited to create the ornaments. The Arts Commission took a tour of Northwest Portland galleries, including the Elizabeth Leach Gallery (pictured), following its Dec. 4 meeting at the Pacific Northwest College of Art. Pictured (left to right) are: Vice Chair Libby Tower; Public Art Coordinator Meagan Atiyeh; Commissioner Avantika Bawa; Community Art Coordinator Brian Wagner; Commissioner Christopher Acebo; Chair Julie Vigeland; Commissioner Anne Taylor; and Executive Director Brian Rogers. Applications for the Oregon Media Arts Fellowship are due by 5 p.m. on Monday. Feb. 1. Plein Air artists completed a successful 3 month period of painting in the Yaquina River Watershed as part of the second annual Toledo Plein Air Event and Open Juried Plein Air Show. The event is sponsored by the Yaquina River Museum of Art. 2015 Jurors were Becky Miller and Michael Gibbons. Jacksonville artist Sue Bennett recently received an announcement that her painting “Yasek Loop Barn” has been chosen for the Permanent Collection Purchase Award from this year’s exhibit at the Yaquina River Museum of Art, Toledo, Oregon. Sue Bennett is a classically trained artist who lives and works in Jacksonville, Oregon. She and her husband Steve (also an accomplished painter) traveled to Toledo, Oregon to paint during the summer and the result is “Yasek Loop” oil 8 ½” x 11 ½” a brilliant example of the rural landscape in the watershed.